This simple extension helps you to easily open a text based file in default or configured editor. Currently it supports only Notepad as the external editor. This extension will be helpful if you wanted to open a source controlled file easily with out a file check-out . So, now it’s time I need to work with VS2015 – not that bad at all. 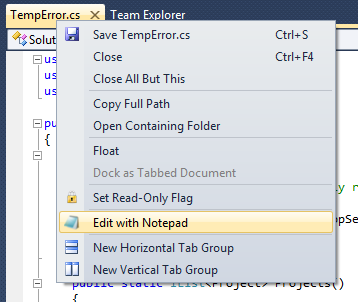 Another extension “VS Open in” allowed to configure the editor, but is not working in/with VS2015. Do you already have plans to add a configuration for the editor to be used?